Showing 40 articles from August 27, 2014. Following what was described as a smooth opening, Franklin County Schools are almost certainly going to surpass 9,100 students this year. The second-day attendance on Tuesday totaled 8,556 students actually in classes, excluding the 596 kindergarten students who still haven’t begun attending. 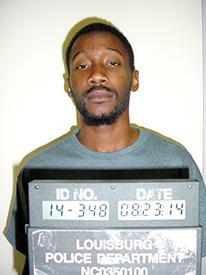 LOUISBURG — A Franklinton man is slated to appear in court next month on murder charges. Louisburg police arrested 23-year-old James Scott Perry II on Aug. 23, alleging he shot and killed Doran Long during an altercation in front of a Louisburg convenience store. It’s the first homicide in town since a murder-suicide in December 2011. FOOTBALL FRIDAYS RETURN. High school football season returned to Franklin County last Friday night as Louisburg, Bunn and Franklinton were all on the road for their gridiron openers. Louisburg used this strong run from Tyree Thorne to take early command during its victory at North Johnston. Franklinton was a winner at Goldsboro, while Bunn was defeated at Wilson Fike. FRANKLINTON — At least one question about the town’s decision to sell its water system has been answered — a meeting place has been chosen for a joint session between all interested parties. 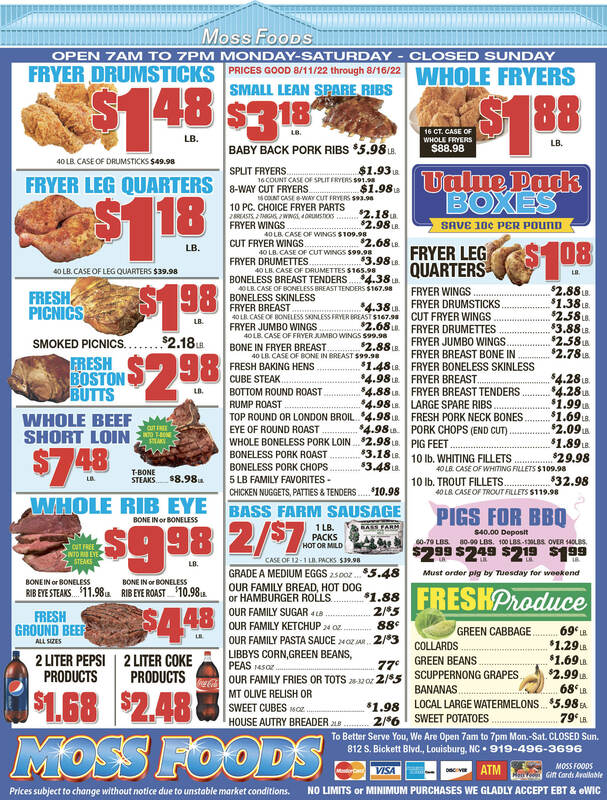 The full ramifications of such a sale, though, remain an evolving mystery. During the town’s Aug. 19 meeting, commissioners agreed by a 4-1 vote to enter into a Memorandum of Understanding that outlines the terms by which Franklin County would buy the system. ZEBULON — The cause of a fire that killed a woman from out of state looks like it will remain a mystery, officials have said. Fire and rescue personnel responded to 49 P.G. Pearce Road before 3 a.m. on Aug. 25 to find the house on fire. Three adults and two children, ages 7 and 4, escaped the blaze, but 55-year-old Emma Jean Witters died in the fire. Sheriff Jerry Jones said investigators may never be able to determine the cause. LOUISBURG — The county’s park and recreation advisory board were slated to host a special meeting to plan for a new county park. The board was scheduled to meet earlier this month, but the meeting was cancelled when staff realized they wouldn’t have enough people to form a quorum. One of the perks of my job is that I get to be the fly on the wall sometimes, listening to politicians and other leaders talk about subjects that may not be Page 1 news, but which are important. Often, those discussions include “wish lists” of things they’d like to see happen. But while reporters are supposed to listen and not speak, when we get back to the office, we do get to write opinion pieces like this one which can either dissect the ides or offer suggestions on how to make wish lists a reality. Remember the old saying: Act in haste but repent in leisure? 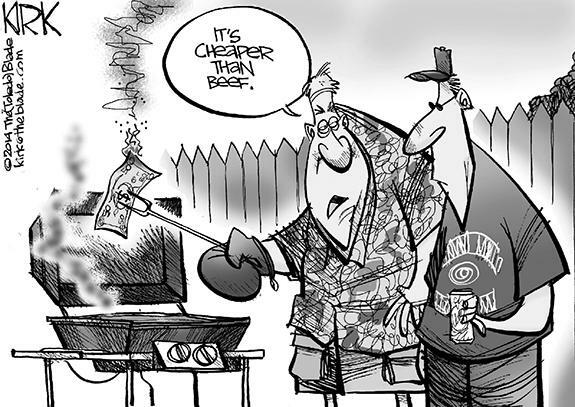 We hope that’s not going to be the situation in Franklinton, but it seems that there are a lot of unanswered questions about the town’s proposed sale of its utility system that should be answered before ink is applied to the signature line of any contracts. Like most people, my idea of jurisprudence has been colored by prime time television. One of my favorite shows of all time is Law & Order. 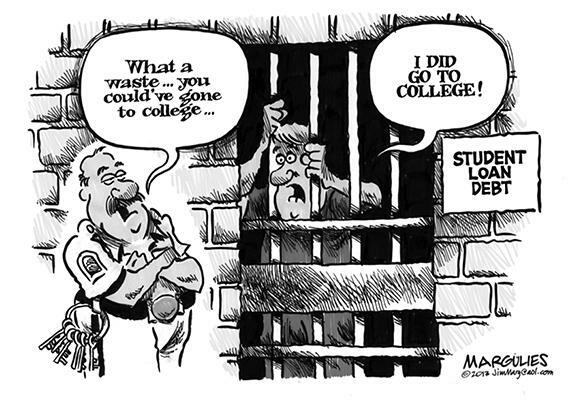 Defending public education or just helping others gut it? Last week several Franklin County residents asked if I had seen Sen. Chad Barefoot’s mailers. My reply was in the negative; they were never mailed to my address. By week’s end, I had obtained copies and a couple of big belly laughs. Incredibly, Barefoot is trying to portray himself as a leader in the State Senate and a defender of public education. Another chapter is written in the ongoing story of our local leaders’ inability to understand the importance of history. I am referring to the removal of the bell from the courthouse in Louisburg. It is not so much the removal of the bell; it is the way it was done that is most troubling. There is evidence this bell’s origin may predate the Civil War. OXFORD - Mr. Billie Joe Loyd, Jr., died August 26, 2014 in Granville Medical Center. He was the son of the late Billie Joe Loyd, Sr. and Elma Sykes Loyd. He was a native of Franklin County and was of the Baptist faith. LOUISBURG - Funeral services for Doran “Trizzy” Long, 25, who died Saturday, Aug. 23, 2014, will be held at 1 p.m. Saturday, Aug. 30, at Haywood Baptist Church. Burial will follow in the church cemetery. FRANKLINTON —Eula Perry Wright, 92, died Tuesday, Aug. 26, 2014 at Hillside Nursing Center. A graveside funeral service will be held at 1 p.m. Friday, Aug, 29, at Fairview Cemetery, with the Rev. Carl Hunter officiating. ZEBULON – Louis Russell Rice, 87, of Zebulon, died Monday afternoon at his home. 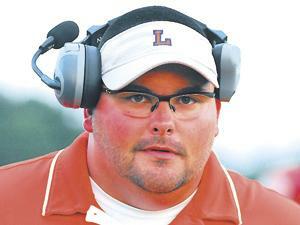 RUNAWAY TRAIN FOR LHS. Louisburg’s Javonte Taylor returns a punt last Friday night against North Johnston High School in Kenly. 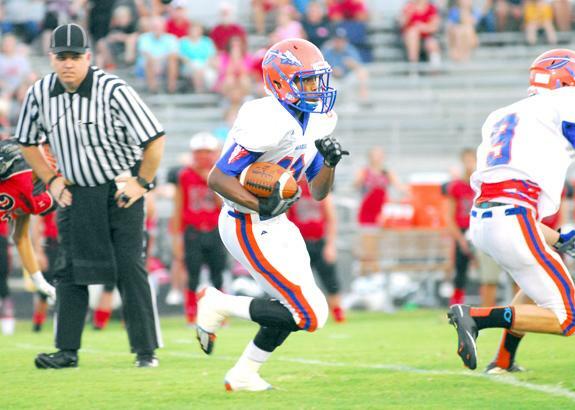 KENLY -- After committing some untimely special teams mistakes early in the game, Louisburg more than made up for them the rest of the way during last Friday’s regular season prep football opener at North Johnston. BONK. (L to R) Franklinton’s Smith Gupton and a Southern Nash player make contact while going for the ball during Tuesday evening’s non-league boys soccer showdown at the FHS Football Field. 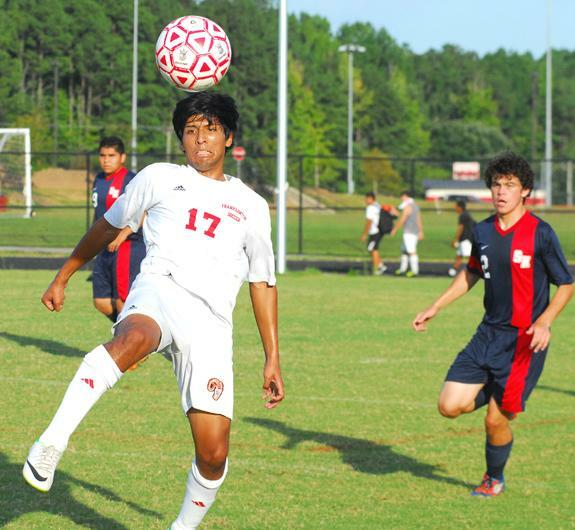 FRANKLINTON - Franklinton has finished in second place in the Northern Carolina Conference boys soccer standings in each of Coach Isaac Welker’s first two seasons in charge of the program. Now, it’s time to take the next step. And with seven key returning starters, the Red Rams seem destined to take another shot at NCC supremacy. HEMMED IN. 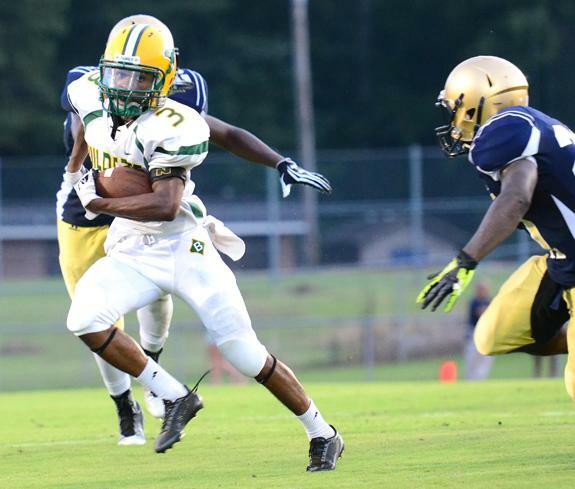 Bunn’s T.J. Jones tries to find some running room last Friday against Fike. The Golden Demons did nothing to dispel that notion during their opener last Friday at home against the Bunn Wildcats. TOP CAT. Veteran junior Charlotte Murphy will be at the No. 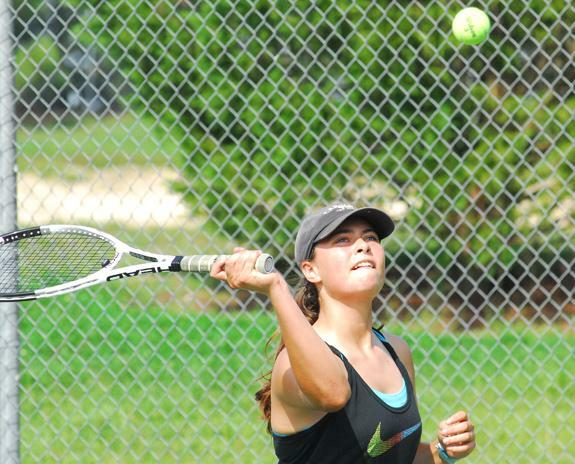 1 Singles position this season for the Bunn High School girls tennis squad. BUNN -- Duane Gatson built the Bunn High School boys and girls tennis programs into a respectable force in the Northern Carolina Conference during his extended tenure. But that stint ended in May with his resignation to devote more time to family and other pursuits. That left BHS scrambling to find a coach on staff -- basically anyone willing to put in the time and effort to work with players. GOLDSBORO -- In a game of crazy momentum swings, Franklinton had the final say during a 29-20 road victory over Goldsboro last Friday night in the prep football season opener for both clubs. The Red Rams appeared well on their way to a convincing victory as they put up 20 uncontested points in the first half of action. 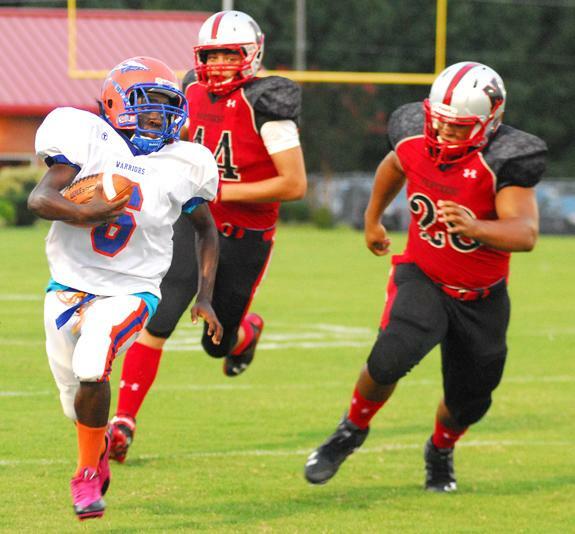 Northern Vance at Franklinton 7:30 p.m.
Louisburg at Rocky Mount Prep 7:30 p.m.
Southern Nash at Bunn 7:30 p.m. HOLD HIM OFF. 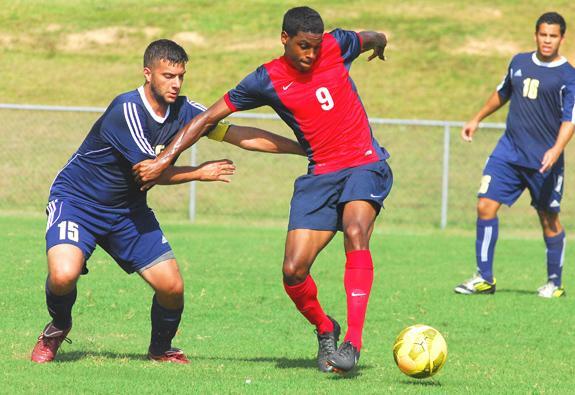 Louisburg College’s Nigel Robinson holds off a Wake Tech player during Tuesday afternoon’s Region X men’s soccer matchup at Ronald May Field. 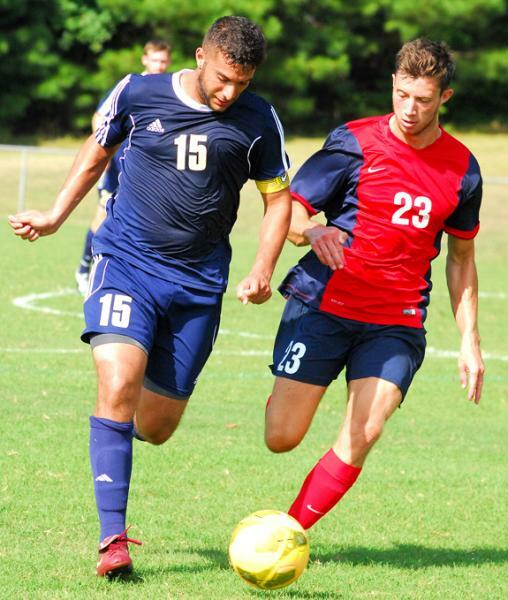 LOUISBURG -- When Louisburg College filled its men’s soccer coaching vacancy two seasons ago, the Hurricanes opted for youth and potential in the form of the unproven Cristian Neagu. All Neagu did was take the Hurricanes to the national finals in his first season. LC lost in overtime in that match, but Neagu had made an instant impact. CREEDMOOR -- Franklinton High School faced one of its stiffest challenges of the 2014 volleyball season just one week into its schedule. Taking on the defending state runner-up South Granville Lady Vikings on the road, Franklinton hung tough but couldn’t pull out a victory. FRANKLIN COUNTY -- The Middle Athletic Conference football season will kick off on Sept. 17. Following a seven-game schedule, teams will face off during playoff week on Nov. 5 at sites to be determined. WINSTON-SALEM -- Jerrud Sabourin singled home Yhoxian Medina in the 12th inning for his third RBI of the night and the Carolina Mudcats beat the Winston-Salem Dash 6-5 on Monday night at BB&T Ballpark in a Class A Carolina League baseball showdown. The Mudcats (31-31, 60-69) became the first visiting club to sweep a four-game set from the Dash (28-35, 58-74) in the Triad since BB&T Ballpark opened in 2010. 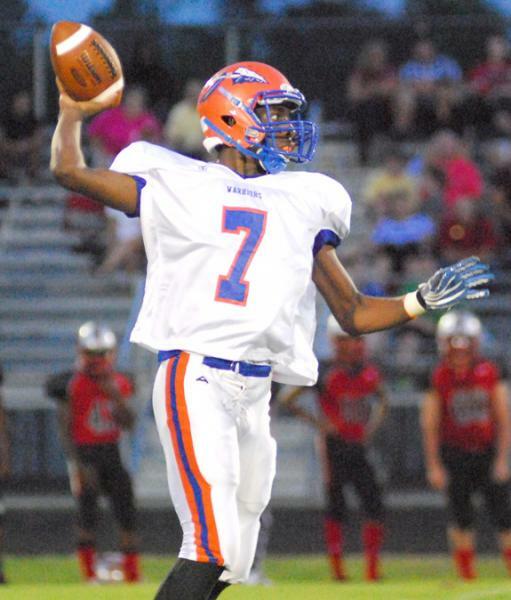 Malik Sidibeh had an effective first start as the quarterback for the Louisburg Warriors during last Friday night’s road win at North Johnston. Wake Tech’s Bijan Amiri and Louisburg’s Max Blackmore compete for a ball during Tuesday afternoon’s men’s soccer showdown at Dr. Ronald May Field on the LC campus. 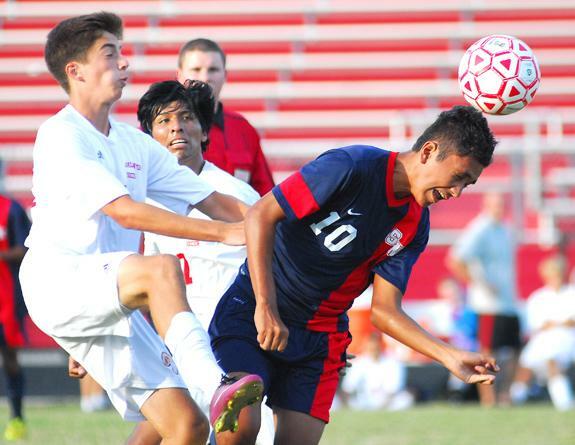 Franklinton’s Josh Ortiz shows patience while waiting for the ball to land on his foot during Tuesday’s home soccer showdown against Southern Nash. Because of the invention of television, the internet, and smart phones, we are becoming personally separated from the outside world. But, there is a tremendous value in connecting to other cultures and experiencing the realities of other ways of living. There are other cultures that can show us some interesting things and can also make us see and appreciate a bit more of our own culture. 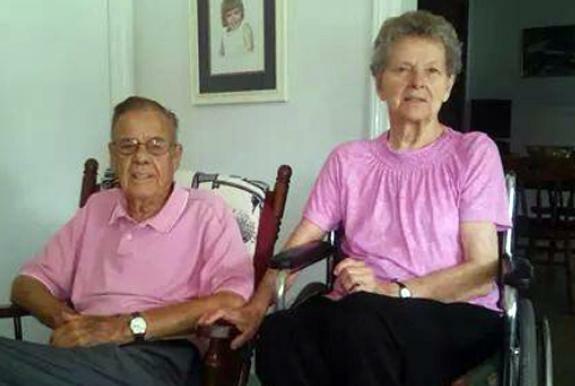 Leola and Willard Haley met in the late 1940’s. She was 16 and he was 22. They went on a double date. Willard was with his girlfriend and Leola was with his friend. Some time later, they went out again, just the two of them, and they have been inseparable ever since — 65 years this year. They were married in 1949. Thursa Burnette Lopez of Louisburg announces the approaching marriage of her daughter, Dorothy Lorraine “Daffy” Burnette, to Henry Bunnie Shearin III, the son of Henry Shearin Jr. and Edith Shearin of Louisburg. The bride-elect is also the daughter of the late Cloice “Tinker” Burnette and the stepdaughter of Salvador Lopez. 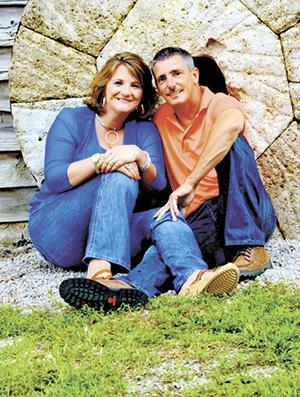 A Sept. 6, 2014 wedding is planned at 4 p.m. at Wood Baptist Church, Louisburg. David Lee and Marilyn Jacobs of Franklinton announce the engagement of their daughter, Yolanda Davette Jacobs, to Jacquin Ray Hopkins, the son of Donald Ray Hopkins and Jacqueline Crudup of Bunn. 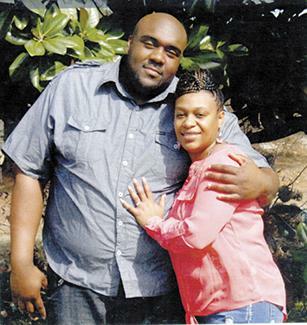 The wedding will take place at 3 p.m. on Oct. 11, 2014 at Gethsemane Baptist Church, Bunn. 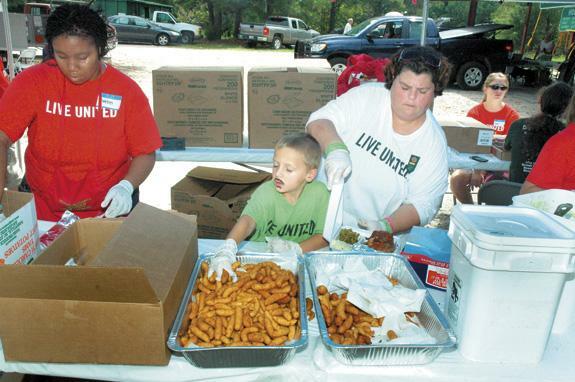 Bradlee Fowler, center, helps his mother, Debbie Fowler, right, and Girl Scout Takara Wilson, left, prepare plates during last Friday’s Local Food Roast sponsored by the United Way and the Franklin County Cooperative Extension Office. 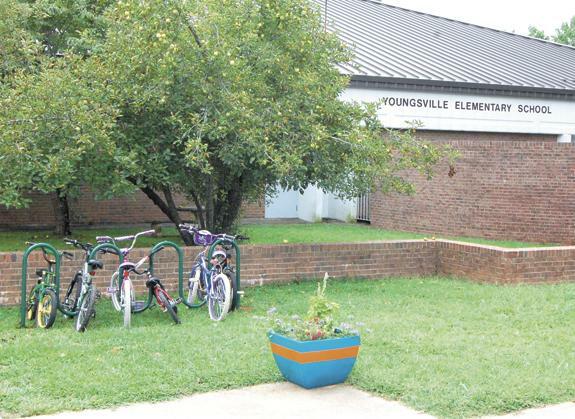 Youngsville Elementary School parents raised money for a bike rack and had enough leftover funds to buy planters and give an old garden new life. Lynn White spearheaded a crowdfunding effort to raise money for a bike rack so her son and several neighbors could ride their bikes to school this year. The response was so overwhelming that nearly double the funds needed were raised. In addition to installing a bike rack, planters were purchased (pictured in the foreground) for the sidewalk. BUNN — At the intersection of Dead Road and Dead Drive, a Louisburg woman’s apparent attempt to get home with drugs came to an end. According to a report by Dep. Allen Batchelor, officers were on stationary patrol on Bunn Elementary School Road when they saw a vehicle make a quick in and out trip to a home on Scarboro Drive that is known for drug activity. LOUISBURG — ALS is a disease that affects nerve cells in the brain and spinal cord, closing down motor neurons, preventing the brain from initiating and controlling muscles — slowly shutting the body down. The progressive degeneration ultimately leads to death. Recently, though, an ice bucket challenge has shed light on the disease and brought to life renewed efforts to combat ALS, more commonly referred to as Lou Gehrig’s disease. Participants at the Louisburg Senior Center are planning their own ALS Ice Bucket Challenge on Friday to raise money and awareness. Participants there found out one of their friends was diagnosed a few months ago and have decided to take on the challenge.